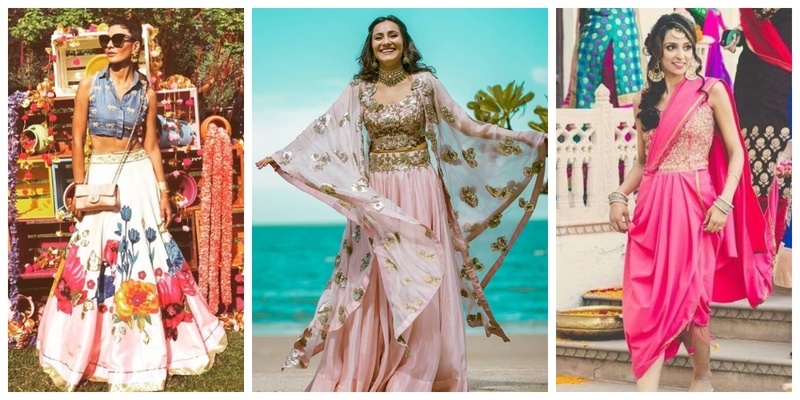 15 Brides who pulled off stunning Indo-western Outfits for their wedding ceremonies! Trends keep changing with the blink of an eye. And when its the occasion of wedding, brides tend to experiment a lot with their outfits to match up with their off-beat style. This bride nailed her Mehndi ceremony by pulling off the coolest Indo-western denim top and floral print lehenga outfit. Just loved her complimentary Kala Chashma Swag! This minimalistic bride opted for an amazing Boho sheek outfit for her Goan wedding and she sure was able pull it off in her offbeat sizzling way! This super cool bride wore an amazing offbeat Indo-western jumpsuit during her Mehndi function. Absolutely adore her simple yet hattke style! This amazing sister duo pulled off these Banarasi Lehenga gowns in the trendiest way possible! Simply Wow! These two oh-so-pretty ladies opted for a dhoti sari outfit for the Mehndi ceremony. Super cute and super cool at the same time! This style-swagger bride totally pulled off her Mehndi outfit with an unmatchable grace. Complimentary glasses definitely give a style statement to the look! Another alluring example of a bubbly bride giving us #swaggoals with her yellow embellished crop top and dhoti outfit. Our international bride from Kenya just portrayed one of the most trendy outfit collection in her wedding ceremony. Her choice of this heavily embroidered jacket top with a pink plain dhoti is setting up major Indo-western outfit goals. A very pretty Bohemian outfit coming from the house of Arpita Mehta. This minimalistic bride pulled off her yellow Bohemian outfit in her own simple and stylish. Just loved it! I am just not able to get over this amazing white mini skirt sari that this sizzling bride picked out for her wedding. Sheek and stylish outfit carried with such cool grace. Amazing! This bubbly bride paired her yellow embellished crop top with a plain white long skirt and a sheer yellow cape. Definitely loved her amazing style! Sonam Kapoor, who recently had a much talked about grand reception in Mumbai, wore a grandeur jacket lehenga to her wedding reception. The beautiful grey and brown lehenga compliments perfectly her trendsetter image. Nailed it as always! Youtuber and Blogger Sherry Shroff, who wore a breathless Gaurav Gupta saree gown to her wedding ceremony definitely gave a jaw dropping appeal. This hot and sizzling biker bride chose an outfit perfectly blending with her swagger personality. Quite an appealing look, isn’t it? This pretty smile bride opted for a pastel pink lehenga with an embroidered blouse and cape. The colour and the style definitely blends perfectly with her cheerful appearance. Experimenting beautifully with her look, this blogger bride ruled her Mehndi ceremony with an all embellished ensemble—Short kurta with layered sharara and cape! With this we conclude our list of trendy Indo-western bridal outfits, hoping to have given you some amazing outfit ideas. Go on and rock your special day in your own trendy way!